Humidifiers help raise the level of humidity or moisture in the air. Increasing the humidity in the home helps eliminate the dry air that can irritate and inflame the respiratory passages in the nose and throat. 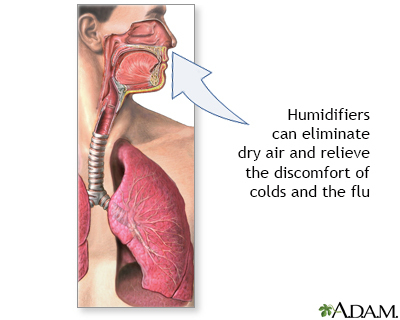 Humidified air can relieve the discomfort of colds and the flu, and help people who suffer from asthma.